Mrs. Annie M. Clephana sends a check for $25 and her daughters check for $10. 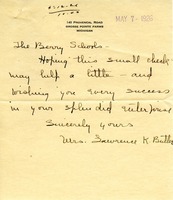 Mrs. Butler sends a small check to The Berry Schools and hopes it will help out a little and wishes them a happy success. 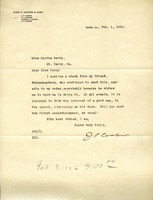 A letter from John P. Cooper detailing an enclosed amount of $100.00 to be given his friend Schnackenberg. Miss Elizabeth B. 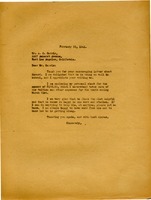 Brown sends Miss Martha Berry a check to help towards damage caused by a fire. 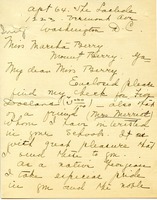 Mr. Abbott writes to Martha with a check to the Berry school. 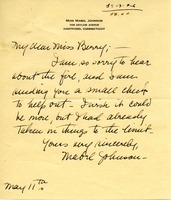 Miss Mabel Johnson sends a check to help towards a fire at the Berry Schools. The way "my" and "miss" are spelled is interesting. After the bilabial-voiced -nasal-stop, the author writes an "e" where it is usually not used. What is interesting is that the author writes an "e" before two different sounds: a high-front-lax vowel and a diphthong. The author's wording is different as well. She does not use pronoun's where they are usually used in sentence structure. 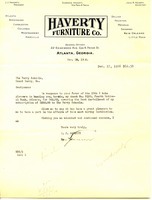 Letter enclosed with check of $136.00 from Martha Berry for Howard to cover tuition. Mrs. Hills sends Martha Berry a check to help rebuild after the fire. Mr. Herty sends Martha Berry a check to aid in the rebuilding process. 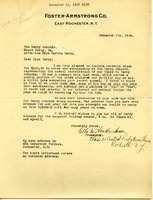 Ella Hendrickson sends Martha Berry a check to cover the cost of one scholarship. J.J. Haverty lets the gentleman at the Berry Schools know what a pleasure it was to have a part in their institution. 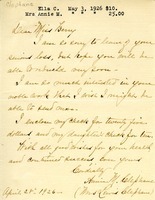 Hayes sends Martha Berry a donation from herself and one from a friend, Mrs. Merritt.